Network Video Recorder or NVR Camera Systems by Clear IT Security offer the latest and greatest technology available in today’s camera systems. Our NVR IP camera systems are completely digital and essentially mini computers that are networked together using the same CAT5e/6 network cabling and switching equipment computers use. As a result, they produce the highest quality videos as no analog to digital conversion is required. These systems are also highly customize-able and offer flexible connection options. NVR IP Camera Systems require more time and knowledge to setup and configure than DVR Camera Systems. Analog DVR Camera Systems are as simple as plugging it in and turning it on. 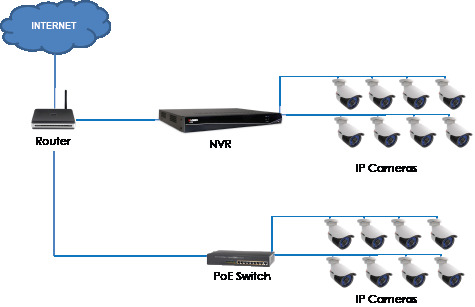 NVR IP Camera Systems require additional configuration before they will connect and record. The NVR must first be setup with each camera’s IP address, correct username/password credentials, protocols, ports and configured to record the streams from each camera. The camera’s resolution, frame-rate, codec and other camera specific options must be set appropriately for the given requirements or job. None of this is necessarily “hard” – it is basic, fundamentals of networking and camera systems but does require skills that many traditional CCTV installers are unable to work with due to a lack of IT or computer background. IP cameras have web-based administration interfaces that allow can be programmed individually and do not require a NVR to function like an analog system does. This means that you can have IP cameras that are not directly connected to a recorder! You can have an IP camera connected to a network by itself and view or configure the camera independently without the need of a recorder. Remote or multi-site cameras can now be setup to record to an off-site recorder. This is possible because IP cameras process video on the camera rather than on the DVR like analog camera systems do. Some IP cameras even support recording directly on the camera to an SD card slot and on-board microphones for recording audio. There are a vast amount of options with IP cameras that you simply will not get with typical analog HD technology. For most home owners and small businesses, systems of this complexity are not needed and a good high-quality Clear IT Security DVR Camera System will fit the bill at an affordable cost. However, larger homes and businesses will benefit from the flexibility and advanced features only available on a Clear IT Security NVR IP Camera System. Overall both technologies offer a very similar end-user experience when viewing the cameras directly on the unit or remotely. When it comes to picture quality and recording, a 2mp analog HD vs IP camera will produce similar results. All Clear IT Security Security Camera systems offer large capacity recording options as well as similar menu layout, functions, recording capabilities and remote apps for viewing. It really boils down to what your budget and requirements are.